"May I see your tongue, please?" Have you ever wondered what I’m looking for when I ask to see your tongue? In Chinese medicine, the tongue is thought to be like a map showing the health of the body, similar to foot or hand reflexology charts where different areas correspond with different parts of the body. When looking at the tongue, It’s best to view it in natural light, if possible. I need to look at it relatively quickly, because the tongue body will start to become more reddish-purple the longer that it is stuck out. So, what exactly am I looking for? I am assessing the color, size, and shape of the tongue body, as well as the color, thickness, and distribution of the tongue coating. A normal tongue is pink (or light red), with a thin, white coating. What does it mean if your tongue doesn’t look like that? Some variations indicate a condition affecting your whole body, while others may just be associated with a particular are of the chart. For example, the tip corresponds with the chest (Heart and Lungs), the center part with the middle of the abdomen (Stomach and Spleen), the back corresponds with the lower abdomen (Kidneys and Intestines), and the sides correspond with the Liver and Gall Bladder. All of these organ names refer to the understanding of functions of organs and channels within Chinese medicine, not necessarily their Western anatomical counterparts. Tongue body colors might be: pink or light red (normal), pale (deficiency), red (heat), or purplish (stagnation). A red tip is often associated with poor sleep, although it may also be due to heat damage to the Lungs from an illness or smoking. Sometimes there are raised red or purplish dots, which shows that there is more longstanding Heat or Stagnation. Tongue coating that is thick usually indicates Dampness, often caused by a weak digestive system. A yellow coating indicates Heat, a “map” or “geographic” coating or no coating can mean a lack of fluids in a particular part of the body. A gray or black coating that is not due to a medication, such as Pepto Bismol, indicates a more serious problem. Tongue shape: thin can mean a lack of fluids, swollen can be excess Dampness, toothmarks can either be from Dampness or a deficiency. 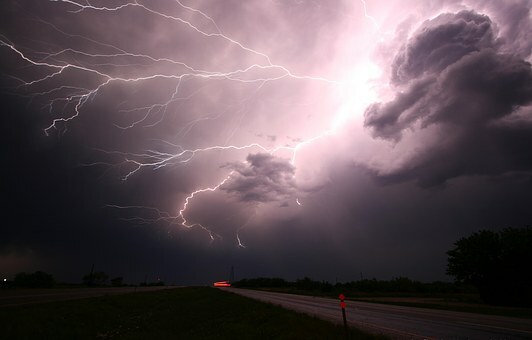 Shaking indicates Wind, but can also show up with anxiety. Some cracks are congenital, but generally cracks indicate a more chronic lack of fluid. Some practitioners also look for sublingual veins (swollen veins on the underside of the tongue.) The more prominent the veins, the more longstanding the stagnation. 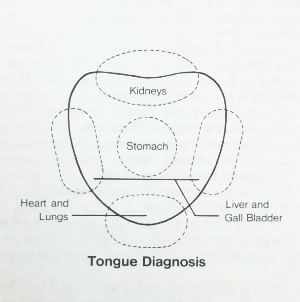 The tongue is just one part of the diagnostic process. I put together my observation of all the different parts of the tongue: body color and shape/size, coating, and sublingual veins, along with what I observe about a person's overall physique, what I feel in the pulse, and their responses to my questions to form a diagnosis. Although Chinese medicine uses some very basic tools of assessment, they are based in thousands of years of empirical evidence. It's the Year of the Earth Pig! 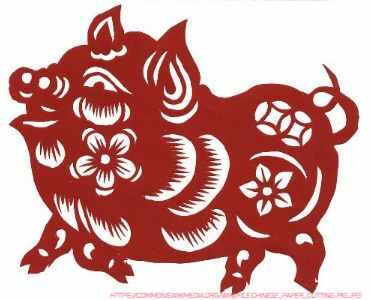 The Lunar Year of the Yin Earth Pig began February 5, 2019. The system of 12 animals combined with the five elements creates a 60-year cycle, with the Pig as the final animal of the cycle. The end of each 12-year cycle means that there is a lot of energy around completion and concluding things, so it’s a great year to finish projects, even if they are not done perfectly! The Chinese character for ‘home’ is a roof with a pig under it. The Pig is the ultimate symbol of nourishment, nurturing, and generosity. The qualities of the Yin Earth Pig make it a good year to focus on home, farming, health, good food, rest, relaxation, and comfort. It’s a time to visit with family and friends, cook family recipes, do home projects, work in the garden, and revel in the senses. Enjoy yourself! Pig energy can be somewhat sedentary, so weight gain is likely this year, so light exercise, massage, stretching like yoga, Pilates and Tai Chi and walking are also good and enjoyable forms of exercise. 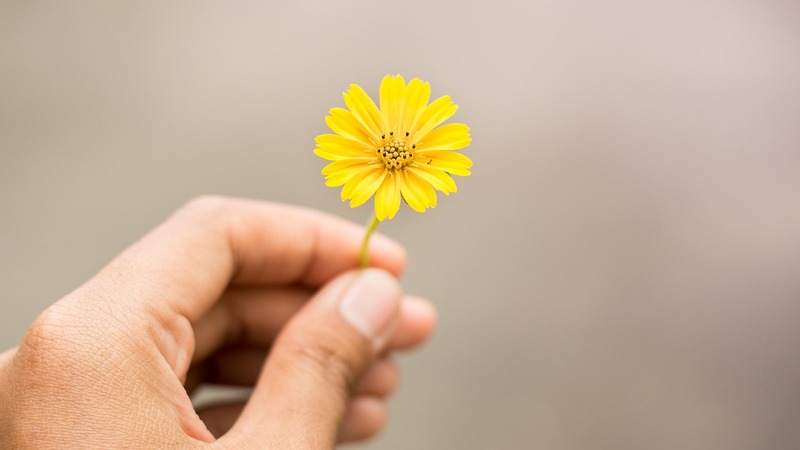 Paying attention to relationships of any kind will be important: family & friends, community, internal affairs, diligence, infrastructure, healing, compassion, introspection, social justice, conflict resolution, reconciliation and truth. Resolve past conflicts and practice forgiveness, lovingkindness, and compassion for yourself and others. While this is a year to focus on family, friends, and community, it’s also a time to dig deep and start exploring the inner workings of your mind, the nature of who you are, and how you show up in the world. This is a time when that which has been hidden gets rooted out and comes to the surface. The main goal of the year is contentment and enjoyment of life. Develop strong rhythms and routines, resting and healing to prepare for the next cycle, all while having fun and enjoying the moment! Fall has always been a time of new beginnings for me - the start of a new school year with new teachers, classmates, classes, and the return to a more regular schedule after the freedoms, expansiveness, and later bedtimes of the summer. As we move into fall, I’m noticing that sunset is coming noticeably earlier and I’m starting to feel a pull to wrap up my evenings and go to bed earlier. And until the advent of artificial light, this is what people have always done – we’ve followed the rhythm of the sun and the seasons. Despite the many wonderful advances in technology and artificial lighting over the past couple hundred years, our bodies have not caught up; biologically, we still follow the same circadian rhythm as our ancestors did centuries ago. So, what is the circadian rhythm? 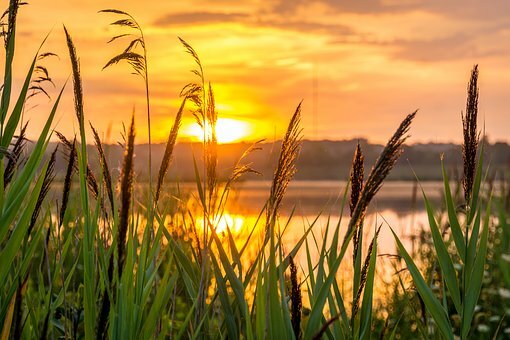 It is a roughly 24-hour cycle of day and night, of activity and rest, which affects not only humans, but also animals, plants, fungi, and even cyanobacteria. In humans, the circadian rhythm affects the sleep-wake cycle, fluctuations in core body temperature, heart rate, and many cellular processes. Two important hormones for circadian rhythms whose levels fluctuate daily are melatonin and cortisol. Their rise and decline complement one another, just like the two halves of the Yin/Yang symbol. Melatonin is secreted by the pineal gland in response to the decreased light that normally happens in the evening; its levels rise about two hours before bedtime and are naturally highest at night. The body’s melatonin production is suppressed by exposure to sunlight in the morning and to blue LED light (found in electronic screens any time of day), so it’s important to limit the use of screens in the evening. Synthetic melatonin is often suggested for people who have trouble falling asleep. The proper dosage, according to a 2001 study from the Massachusetts Institute of Technology, is 0.3 milligrams, about 1/10th of the amount in most pills or supplements. Because melatonin supplements are used to reset the body’s circadian rhythm, they are useful for jet lag, but should not be taken more than a few days. Do not use melatonin if you are pregnant or breastfeeding or have an autoimmune disorder, a seizure disorder or depression. Cortisol, a hormone secreted by the adrenal glands, rises rapidly in the early morning, allowing us to be awake and alert, and gradually declines during the day, causing us to get sleepy at night. Its levels are highest in the morning. Cortisol levels also increase due to acute stress (think of the burst of energy you get when in “fight or flight” mode), during periods of chronic stress, and in response to meals. High cortisol levels can contribute to insomnia. Cortisol also spikes in response to caffeine. So when you drink coffee or tea to get going in the morning, you are artificially raising your cortisol levels to induce the hormonal response your body would normally produce on its own with sufficient sleep. Fall, with its association with new beginnings, is the perfect time to introduce new routines and establish healthy rhythms. Having regular habits, such as going to bed and getting up at a regular time, helps your body to anticipate what’s coming next and to develop stability and reserves for future stressors. More sleep improves energy and balances hormone levels. This year, I invite you to join me in getting yourself to bed by 10 pm and together we'll see what a difference it makes. Fibromyalgia is a chronic condition characterized by widespread musculoskeletal pain accompanied by fatigue, difficulty sleeping, and memory and mood issues. Fibromyalgia is thought to affect up to 6% of the population, particularly middle-aged women, although it can start as early as the teen years. Most people will experience symptoms for the rest of their lives, however, many may experience periods in which their pain and fatigue lessen. Trouble concentrating and remembering, often called "fibro fog"
The cause of fibromyalgia is unknown, but it seems to run in families and most often affects women. It may be triggered by a combination of factors such as infections, genetics, trauma, stress, hormonal fluctuations and lack of physical activity. Anxiety or depression are not a cause of fibromyalgia, but usually make the pain worse. Although fibromyalgia has not been shown to be an autoimmune disease, having a rheumatic condition like lupus or rheumatoid arthritis may increase your risk. Fibromyalgia can be difficult to diagnose because there isn’t a lab test that can detect fibromyalgia. Its symptoms are similar to some autoimmune disorders, and in many cases, fibromyalgia occurs simultaneously with them. How Does Conventional Medicine Treat Fibromyalgia? There is no known cure. It is most often treated with drugs, cognitive behavioral therapy, and stress-relieving techniques, such as muscle relaxation, deep breathing or meditation. 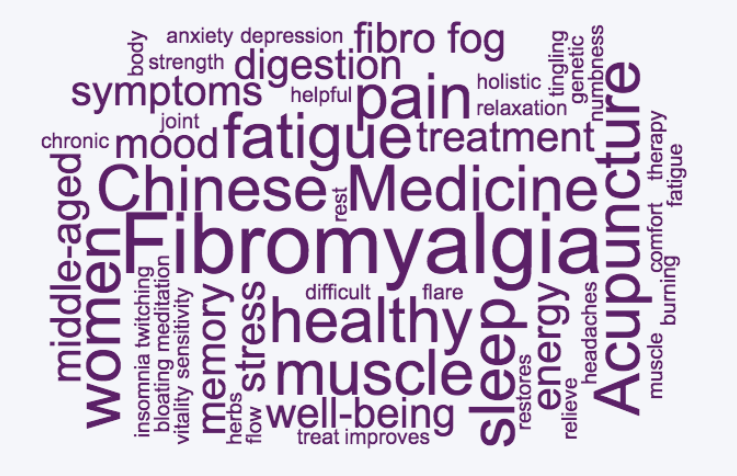 Chinese medicine can be extremely helpful in treating the pain and other uncomfortable symptoms of fibromyalgia . Acupuncture reduces pain, improves blood flow, increases endorphins, and restores healthy body functioning. Chinese herbs decrease pain, relieve stress, and improve energy, sleep, and digestion. Depending on the severity of symptoms, treatment may be more frequent in the beginning, and less frequent as things improve. Regular, moderate exercise to improve blood flow, reduce pain, increase endorphins, and improve mood. Try yoga, Tai Chi, Pilates, walking, or exercising in a warm water pool. Regular bed and wake-up times. Reduce the use of screens in the evening and be in bed by 10 pm. Regular rest. Lie down for 20 minutes a day. An anti-inflammatory diet, rich in vegetables and lean protein. Avoid sugar, wheat, dairy, alcohol, caffeine, processed foods, artificial sweeteners, and nightshades. Add fish oils, coconut oil, olive oil, avocados, and grass-fed meats. Pace yourself. Practice moderation, set limits, and learn to say no, especially to things that drain your energy. Although most people come to see me for acupuncture, it was my interest in herbal medicine that initially drew me to study Chinese medicine. I was recently asked to share more about Chinese herbs, how I use them in my practice, and what kinds of things they treat. While studying Chinese medicine in school, I had 4-5 semesters each of classes on different topics: Chinese medical theory, acupuncture, and herbs (individual herbs and formulas.) Herbal medicine is the oldest form of medicine in every culture around the world. Medicinal substances fall on a spectrum from those that are mild and used as food, to those that are stronger and used more as medicine. Some examples of therapeutic foods include herbs that we use in cooking, such as garlic, ginger, cinnamon, nutmeg, cloves, mint, turmeric, and fennel. Not only do they make food more flavorful, they have additional benefits, such as killing parasites, improving circulation, and aiding digestion. In traditional Chinese dietetics, foods are considered one of the most basic types of medicine and are categorized by their effect on the body. For example, pears have the effect of clearing heat, moistening, and clearing phlegm from the Lungs. When I was in school, we would write and mix up individual bulk herb formulas for patients based on our diagnosis. We would often choose a basic formula (like a recipe) as our starting point, then add, subtract, or change amounts of herbs based on that patient at that moment. As their symptoms would change or disappear, our formulas would also change. In Chinese medicine, the goal is not to put a patient on a formula and keep them on it to “manage” their symptoms or condition, but to elicit a change by treating the root of the problem. Bulk Chinese herb formulas are usually given as a tea or “soup”. Most of these are cooked as a decoction in water for about 45 minutes and are strong-smelling and tasting. Patient compliance is not always very good with those! For that reason, I primarily use herb pills and tinctures. They are easy to use and in a form that is more familiar to most of us. The downside is that the proportions of herbs in the formula cannot be changed and the formula cannot be customized. We are used to thinking in a relatively simple way, that this herb is good for this particular problem, but the way herbs work is far more complex than that. A formula will affect the entire body, not just one part. In western medicine, we tend to think of a particular drug being good for a particular problem. Chinese medicine thinks about it differently: a Chinese medical practitioner makes a diagnosis for each person and treatment is chosen accordingly. Not everyone with the same problem (back pain, for example) will have the same diagnosis in Chinese medicine, and so are unlikely to have the same herbs. Just because an herb is “good” for a particular condition does not mean that it is a good match for each person with that condition. Just because herbs are natural, not all are necessarily safe to use indiscriminately. Treating yourself with herbs is not easy, which is why it’s usually best to consult with an herbalist. Herbs can be used short-term, like antibiotics, or they can be used long-term for more chronic problems. 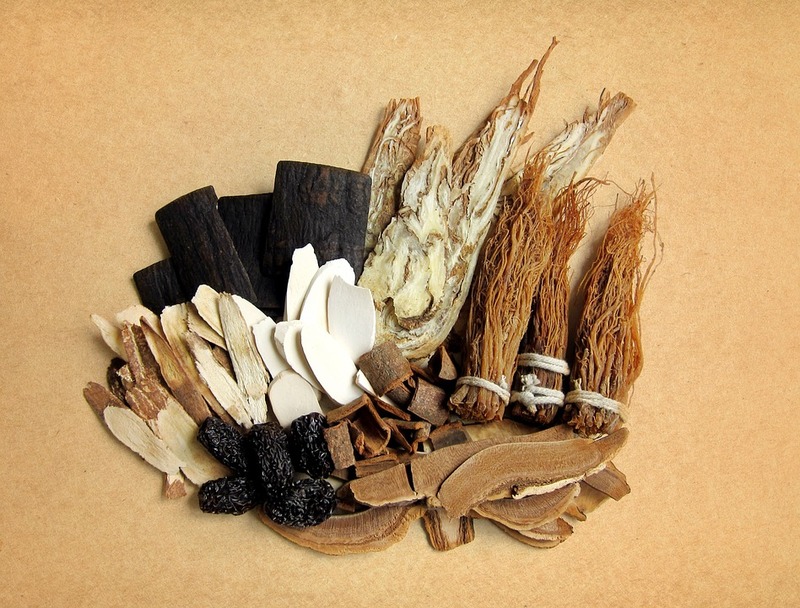 Chinese herbs are categorized based on their function. Those that are in the “Tonifying” (strengthening) category are like taking vitamins or using a drip irrigation system. A little bit taken over a longer time is able to be absorbed more easily and benefit your body more than a massive dose taken once. What kinds of conditions can be treated with herbs? Just about anything: Insomnia, PMS, hormonal imbalances, digestive problems, joint pain, low energy, mood disorders, menstrual problems, infertility, blood pressure, urination problems, fibromyalgia, colds, allergies, immune system issues. Can I use herbs if I’m taking medication? It depends. Acupuncture is always safe to use if taking medications, but herbs may not always be appropriate. Chinese herb teapills are not as strong as most pharmaceuticals. This makes it much easier to vary the dosage, especially for children or more sensitive people. I would be happy to have a conversation with you if you’ve ever wondered if herbs might be of help.